F. Scott Fitzgerald’s classic American novel The Great Gatsby is my favorite book, so my love for the source material did not increase my anticipation for Baz Luhrmann’s adaptation. As evident from the director’s prior works, Romeo + Juliet, and Moulin Rouge, Luhrmann is a filmmaker with more of an appreciation for visual congruence than narrative congruence. My feelings were not eased by the fact that Jay Z produced the soundtrack with such contemporary artists such as Gotye (despite my appreciation for his music), Lana Del Rey, Fergie, will.i.am, and more—none of which being appropriate for a film taking place in the 1920’s jazz era. Despite all the red flags, I ended up seeing the film against my better judgment. The plot for the film more or less faithfully follows that of the original novel. Nick Caraway (Tobey Maguire), young Yale graduate and aspiring bond salesman moves to Long Island in the village of West Egg, where he finds himself residing next to Jay Gatsby (Leonardo DiCaprio)—the richest man around and host to weekly lavish parties. Nonetheless, Gatsby has remained anonymous—that is until he approaches Nick, using him to get close to his cousin Daisy Buchannan (Carey Mulligan)—Gatsby’s old flame and inspiration for his riches. As the two rekindle their old relationship, Nick finds himself learning more about those he deemed his friends and the corruption that lives in 1920’s New York, all whilst exploring the spirit of the times. The Great Gatsby lacks the subtleties, depth, and characterization of the source novel, but this was to be expected. The beginning of the film operates on a break-neck pace, dishing out exposition and character introductions. As the movie progresses, the pace slows down and the movie takes its time where it counts—making for surprisingly impactful and well executed scenes. These are accentuated by an impressive performance from DiCaprio as the titular Gatsby. He delivers one of the more impressive efforts of his career. Luhrmann compensates for the lack of narrative strength with gorgeous visuals. 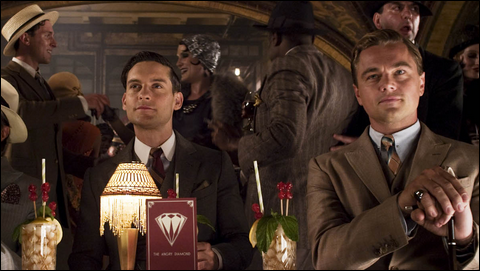 The movie is an absolute joy to look at—especially in the party scenes taking place at Gatsby’s mansion. Vibrant colors and choreography make you feel engrossed—though there are rare moments when it feels too cartoony. The aforementioned soundtrack that I so loathed turned out to be better than I expected. Instead of disdain, it was more hit-or-miss. While some pieces like the rap songs and whatnot definitely took me out of the movie, there were instrumentals (such as Gotye’s “Heart’s a Mess”) that worked exquisitely, and jazz renditions of contemporary songs that also worked well. Ultimately, Baz Luhrmann’s adaptation of The Great Gatsby was anything but, and utterly paled in comparison to the source material. However, for an attempted modernization of the novel, it turned out much better than it could have. The second half of the movie had some strong scenes, and there were strong performances to compliment them. Add excellent imagery and the occasional strong music piece, and you have a film that is at least half as fun as it wanted to be.